There is something magical about an island, something secluded and mysterious and romantic. Remember Bali Ha'i, the enchanting island in the musical "South Pacific?" Or "Fantasy Island," the TV show in which people found their heart's desire? A private island is the perfect place to find romance, peace – or even just a little R&R. Even if you don't own your own island, you can act like you do. Rent a luxury villa or an entire island, and vacation on your own piece of paradise. The advantages are obvious, starting with the scenery. 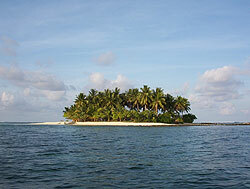 Most private islands are small gems -- lush tropical vegetation surrounded by white sand beaches and set in an azure sea. Then there is the seclusion. It is difficult to imagine a place more removed from the hustle and bustle of most vacation spots. No traffic, no lines, no noise. And no need to worry about heading back to the mainland for dinner, unless you want to. Most accommodations on private islands come with their own chefs, maids and drivers, as well as a whole assortment of activities in the unlikely event that you get tired of lying on the beach. Of course, this kind of experience does not come cheap. But if money is not an object, let your imagination be your guide. You can start your vacation planning on the Internet; a search for "private island vacation" will take you to several sites. As with any Internet search, be sure to check out any company before you send money. In the United States: You can rent Dry Island, in Upper Saranac Lake in New York's Adirondacks. The island has a traditional Adirondacks camp that sleeps up to 10 people. It comes with staff and with a variety of boats, and the rent starts at $24,000 a week. If you are on a budget, you can get Republic Island, in the Michigamme River in Michigan, starting at $550 a week. You'll stay in a rustic three-bedroom cabin and do your own cooking. In the Caribbean: Little Thatch Island, off the British Virgin Islands, is a 54-acre paradise with sandy beaches and a romantic guest cottage called Seagrape Cottage. Rates start at $7,500 a week. In Europe: Rent Horse Island, off County Cork in the southwest of Ireland, with its ancient Celtic ruins and windswept beaches. Guests can stay in three natural stone cottages, which come complete with a peat fire. Rent one house, which sleeps four people, for about $2,300 a week, or take all three for about $6,900 a week. In the South Pacific: One of the more famous private islands is Turtle Island in Fiji, site of the Blue Lagoon made famous in the movies. The island has been a resort since 1980 and caters to those looking for romance and luxury; a staff of more than 150 serves guests at the island’s 14 traditional cottages. A couple can expect to spend more than $2,000 per night, which covers all meals, including champagne and lobster picnics on a private beach; all beverages, including wine and spirits; and numerous activities, including deep-sea fishing, scuba diving and snorkeling, horseback riding, kayaking, sailing, mountain biking, windsurfing and visits to a native village on a nearby island. Or you can have the whole island to yourself for $300,000 a week.